Mr. V is a 42-year-old businessman who has had diabetes for 8 years. He is 160 cms tall and weighs 136 kg. Two years ago, he was started on insulin injections, but his weight went up by 11 kg. His doctor tried reducing the dose of insulin but each time the sugar levels shoot up. Mr. V is in a quandary. He does not want to gain any more weight; at the same time, he wants to control his diabetes. 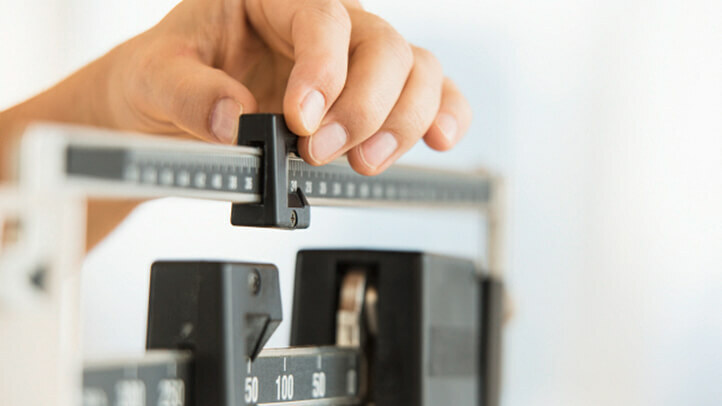 Weight gain is a major side- effect of diabetes treatment which often thwarts the efforts of doctors and patients to attain good diabetes control. Type 2 diabetes the most common variety of diabetes can usually be treated without insulin i.e. by diet, exercise and anti-diabetic pills. However, the pancreas eventually fails and the patient would start requiring insulin injections. Unfortunately, most patients gain weight when they are given insulin injections. Some diabetes tablets also cause weight gain. Some patients have diabetic foot problems or osteoarthritis which prevents them from doing exercise which further increases their weight. What can you do to prevent weight gain if you have diabetes?. Do discuss with your doctor so that he can advise the most appropriate treatment. Even if you require insulin injections, you can minimise the amount of weight you gain by eating smart and exercising regularly. Unfortunately, many people with diabetes keep gaining weight in spite of their best efforts and often need high doses of insulin. Many of these persons are more than 50 to 70 kg above their ideal body weight as in the case of Mr. V.
This is where the role of surgical treatment of diabetes comes in. There is now evidence that certain surgical operations can help patients with diabetes get their blood sugar levels to normal without medications, and maintain it that way, for considerable lengths of time. This is termed “remission” of diabetes. There are two types of Bariatric (or weight loss) surgery helps people to lose weight, by altering the anatomy of the stomach and intestines. In the first (restrictive) type, the size of the stomach is reduced either by removing part of it, so that more than a certain amount of food cannot be ingested at any given time. The second (malabsorptive) type works by creating a new passage bypassing the nutrient-absorbing portion of the intestines, leading to weight loss. Both these types of surgery have been found to be effective in weight loss as well as improvement in diabetes. Both of these can be carried out through a laparoscope and are relatively safe procedures in experienced hands. The hospital stay is also extremely short. Are all patients with type 2 diabetes candidates for bariatric surgery? Those who are the most overweight or obese would obviously derive the maximum benefit, both in terms of weight loss as well as diabetes control. Also, the individual should be willing to have regular follow up and to strictly follow the diet advised; otherwise they may end up regaining much of the weight lost and the diabetes control will worsen. Mr. V’s physician recommended that he go in for bariatric surgery to help achieve weight loss as well as control of diabetes. In the six months following the surgery, Mr. V lost 40 kg in weight. He was able to stop his insulin injections completely and reduce the number of diabetes tablets from five to two. Mr. V has achieved a partial remission of diabetes, thanks to the weight loss surgery.